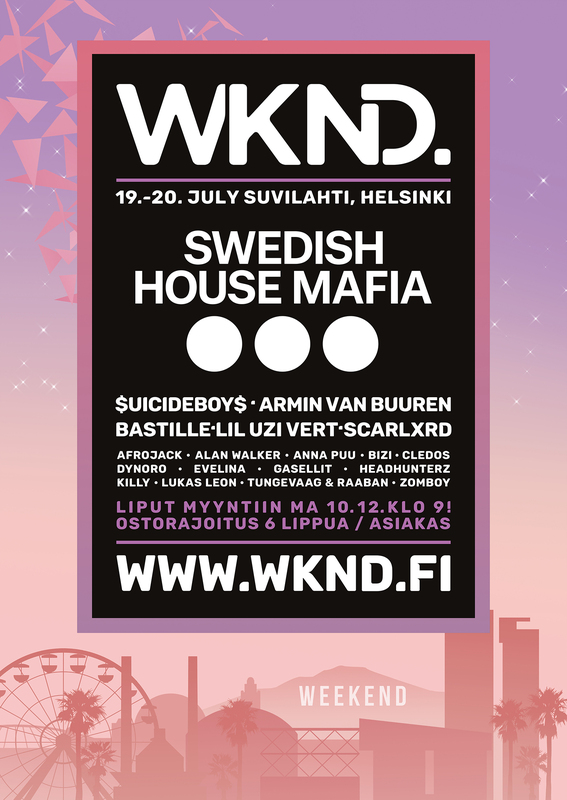 The resurgent Swedish House Mafia have been announced as guests forFinland’s Weekend Festival 2019 (19-20 July, Helsinki) — only their second show in the country ever. They join an eclectic line-up of electronic, hip-hop and pop artists on the line-up for Weekend Festival, which so far includes the likes of Lil Uzi Vert, Armin Van Buuren, Bastille, Suicideboys, Scarlxrd, Killy, Zomboy, Tungevaag & Raaban,Afrojack, Alan Walker, Dynoro and Headhunterz. Held in a stunning urban location in Suvilahti, just minutes away from the city center of Helsinki, Weekend Festival combines high-production outdoor stages with stunning indoor arenas, all tieing into its annual theme. It was previously voted Finland’s best summer festival by listeners to major national radio station YleX, and has received nominations at the European Festival Awards and the Music & Media Industry Awards.